Some things are totally unexpected. Stories are told of unexpected pregnancies, unexpected visitors, even unexpected rain or snow. But we don't always think of unexpected stories, especially when those stories have to do with a stand-alone book that suddenly wants to become a series. Such was the case with Conquering Your Goliaths: A Parable of the Five Stones. It was meant to be one story and Ms. Virginia Bean, or the stones, or God, just couldn't let go. And so what we have is the continuing saga, so to speak, of Ms. Virginia and her Goliaths. It's not enough that she has to figure out what she wants in life when it comes to a career; now she must share this life and all its intricacies with someone else and a child she may never have. What would you do if you were Virginia? Get angry? Forget the power of the stones? Forget all you have learned? 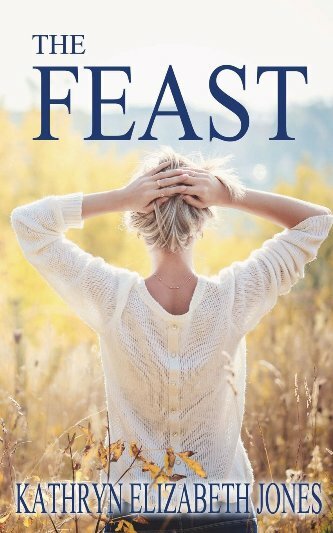 The Feast: A Parable of the Ring, takes you on a journey even further into the depths of a woman's heart. For maintaining a career is one thing; staying married and childless is quite another. I'm hoping you pay a visit. In Conquering Your Goliaths: A Parable of the Five Stones, Ms. Virginia Bean meets God and through the five stones: Listening, Trust, Optimism, Tenacity andConstancy, she learns a few things. About herself. About her relationship with God. About her relationship with others. Listening teaches Virginia how to keep still long enough to listen to God. She Learns to trust in God always, even if she doesn't agree. Optimism keeps her thinking positive no matter what she faces. And Tenacity plays a big factor in moving her forward despite the obstacles. Constancy , well, let's just say that it teaches her the importance of walking with God always. In good times and in bad. Consider that even in the best of circumstances and the most difficult of trials, a person has a way of drifting away from the source of all happiness. Her marriage with Richard was over. This was something Virginia knew for sure. She also knew she must have imagined the stones' supreme power and her awakening with God. As she sat on the couch that still sported a hole large enough for a rock to pass through, she smiled at it sadly, touched the worn fibers of the cloth filling it's gap and thought of Richard and how much she missed him. She thought of her life, alone again, without a husband, without a child. They'd been married five years and during that time Virginia had used the stones and what they represented in her life with Richard. He'd agreed that they held a power, and they'd displayed them on the mantel for all to see. Except the stones hadn't given them a child, and after three years of relentless doctor visits, tests and more tests, Virginia was tired of it all and Richard was gone. He said he loved her. She said she loved him, but without a child their marriage seemed a void, a mistake. She thought of Richard, imagined him alone in a hotel room outside of town. It was winter and the air was bitter, icy and dry to her skin. Her skin felt like sandpaper and her throat practically closed off at night as she breathed in the stagnant air. Virginia walked to the bedroom and to her side of the bed. A tear dropped onto her pillow. The side next to hers still held Richard's pillow. She reached for it and pushed it against her chest, breathing in the scent of him, sort of an Irish Spring with a smattering of spruce. It was the trees he loved best, and they'd spent many days following their wedding hiking the mountains and sitting next to plants and communicating with them. It didn't seem so natural now, but then, right after she'd discovered it, it was like the power of the stones enveloped everything and everyone she knew. At the wedding, long lost friends and family who never dreamed she'd wed, and even the flowers and other natural growth near the lake, breathed in their love and she could feel their presence. She knew God was there. She'd felt him too. In the days following her wedding she hoped he'd come to her again or direct her to meet with him, but he never did. The stones sat on the mantel, and although she was reminded of their glow or colors from time to time, life caught up with her and her business began growing faster than she could keep up with it. Just Desserts . Using Richard's place, a log cabin built only 10 minutes from the city, she'd grown her business both in clientele and opportunity. Many people taking her awakening courses had found their lives improved and their own businesses and personal life, soaring. But the fights and lonely nights without Richard had finally taken its toll. He hadn't returned and it had been a week. She dared not teach, for in teaching she would see him. And so she'd cancelled her classes and hired a runner to take what she had baked from home to Richard's place on the corner of North Shoreand Main. Though she'd done plenty of baking there since meeting Richard, now it just seemed awkward. She stood and reached for the white stone but as she stood there, feeling the veins in the rock's surface, it didn't speak to her. She wanted to hold the black rock, but hesitated. No, she'd leave it there. She wouldn't reach for the other rocks, she couldn't.